There is another aizuri-e bijin print in the Lyon Collection by Toyokuni II - item #596. In both the woman's pose is basically the same, but the robes are different. The woman in this print is wearing a kimono decorated with bats and gourds, both extremely auspicious symbols. 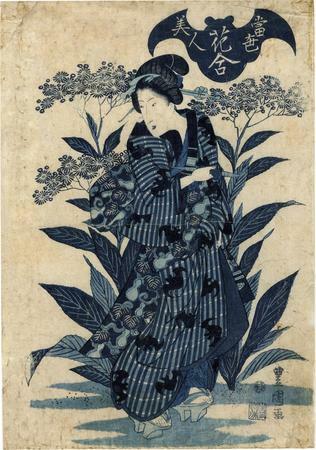 This woman is holding a pipe or kiseru and in both prints in this collection there are clusters of flowers to be seen just to left - our left - of their heads.